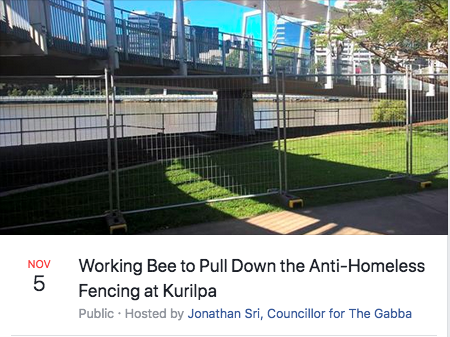 Please join us for a 1-hour working bee to dismantle the temporary fencing underneath the Kurilpa Bridge and send a clear message to the State Government that they should be helping homeless people by housing them, not moving them on. Please bring adjustable wrenches/spanners and wear closed-in shoes. Kurilpa Point has been a camping area for Aboriginal people for thousands of years. More recently, it has been a refuge for homeless and marginalised Brisbanites, and is one of the few inner-city areas where people can find somewhere to sleep that’s out of the rain. The State Government has just installed temporary fencing around the covered area under the Kurilpa Bridge to stop people sleeping there. We understand they will then undertake expensive landscaping works to make the area less comfortable for homeless people to gather. It’s obviously not ideal that people are sleeping rough under the bridge. It’s not a safe place, and homeless people in this area are regularly the victims of serious crimes including assaults and robberies. But they are choosing to sleep here because it’s preferable to any other options available to them. Rather than spending tens of thousands of dollars on fencing and hostile landscaping, the State Government should be investing more money in the construction and acquisition of public housing, and on support services to help people deal with mental health and substance abuse issues. Please join us to send a clear message to all levels of government that this kind of response to homelessness is not acceptable. Even if ultimately the government does go ahead with the anti-homeless landscaping, it’s important that we as a community do offer some resistance to such actions. If you don’t want to help dismantle the fencing yourself, you can still come along to show your support, and perhaps bring snacks or drinks to share with other attendees.